The Polish National Radio Symphony Orchestra is the country’s leading performing ensemble and one of Europe’s finest broadcasting orchestras. 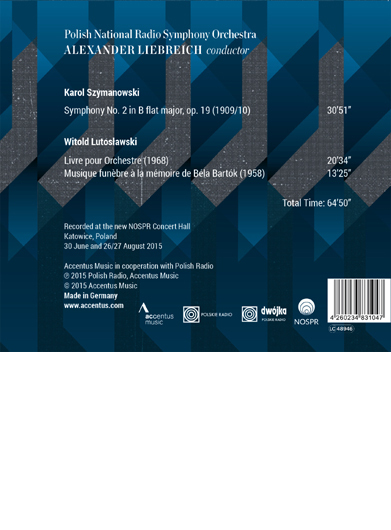 Building on a long tradition, the group performs throughout the world as a musical ambassador for Poland, often featuring works by Polish composers – as the pieces by Karol Szymanowski and Witold Lutosławski on this CD impressively demonstrate. This is the orchestra’s second album with their Principal Conductor Alexander Liebreich. Their first CD together, also with compositions by Szymanowski and Lutosławski, is already cited as a reference recording, with “thrilling, technically brilliant performances.” (Der Tagesspiegel) In the work of these twentieth century masters, we encounter “exquisite compositional refinement of the highest order, born of an awareness of the European tradition,” according to Alexander Liebreich. Szymanowski’s powerful and imaginative Symphony No. 2, Lutosławski’s groundbreaking Musique funèbre à la mémoire de Béla Bartók and his masterpiece Livre pour Orchestre were recorded in Katowice’s new concert hall, which opened in 2014 and is already celebrated for its phenomenal acoustics.